Nicholas Sparks, an American romance novelist, is best known for his romantic-drama novels such as ‘The Rescue‘, ‘The Guardian‘ and ‘A Bend in the Road‘. But it was the affectionate romantic entanglements and emotional journey of his characters in novels like The Notebook and Dear John that made them classic, iconic romance films. Other iconic film adaptations of Sparks’ novels are A Walk to Remember starring Mandy Moore and Shane West; The Last Song starring Miley Cyrus and Liam Hemsworth; Safe Haven starring Julianne Hough and Josh Duhamel. Sparks has a total of ten novels that have been adapted to film. The eleventh film adaptation is currently in production, The Choice. Use the authorization code, “choice”. ‘The Choice’ will Star Teresa Palmer as ‘Gabby Holland’ and Benjamin Walker as ‘Travis Parker’, and there will be also be a casting call for Nicholas Sparks’ The Choice extras to fill additional roles as well. Most people may remember Palmer from the zombie romantic comedy ‘Warm Bodies’ as Julie and will appear in the upcoming film ‘Triple Nine’. Walker starred in the Action fantasy film ‘Abraham Lincoln: Vampire Hunter’ and will be in the action adventure film ‘In the Heart of the Sea’. 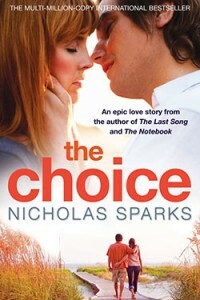 ‘The Choice’ follows the romantic journey between Travis Parker (Walker) and his new neighbor Gabby Holland (Palmer) and life’s defining events that test their burgeoning relationship. Parker is a happy man with an enviable life who thinks he has everything: great friends, a good job and an amazing waterfront home. He believes that his life is complete just the way it is and he does not need a relationship with any woman, Until Gabby moves next door and refuses to allow him into her life. What blossoms from his persistence is a pure and intense love story that struggles to overcome barriers. The Choice ultimately confronts us with the most heart wrenching question of all: how far would you go to keep the hope of love alive? I have always wanted to be an Extra. I have the ability to be happy, sad, hurt, mad, angry, crazy, loving, lonely, depressed, suicidal. homicidal, comforting, and just about anything else that you can think of. I can be silent or I am able to strike up a conversation with anyone or anywhere about anything. I would love to be a fill in or extra on any movies written by Nickolas Sparks or I can go as far out on a limb and be an extra on any of the NCIS programs. I reside in Illinois between Chicago and St. Louis, so I would love to give it a shot! Should you be interested and want further information, photos ect please contact me. This movie was great! I wish I would have seen this last year.